Battling wet, slippery conditions plus several very fast rivals, Australian sprinter Matt Goss scooped an important stage win at the end of stage two of the Tirreno-Adriatico race in Narni Scalo. The Orica GreenEdge rider galloped in ahead of Manuel Belletti (Ag2r La Mondiale), Gerald Ciolek (MTN Qhubeka) and Roberto Ferrari (Lampre Merida), with race leader and stage favourite Mark Cavendish (Omega Pharma Quick Step) having to be content with fifth. Andre Greipel (Lotto Belisol), who has been the standout sprinter in several other races this year, was seventh. The stage was marked by a three man break by Vini Fantini’s Kevin Hulsmans, Cesare Benedetti (NetApp-Endura) and Garikoitz Bravo (Euskaltel). These opened a maximum lead of nine minutes, but the peloton accelerated in the second half of the stage, bringing the move back with thirty kilometres to go. After a short-lived attack by Sep Vanmarcke (Blanco Pro Cycling) was brought back, the sprinters duelled it out and Goss prevailed. Cavendish was outside the top three but had earlier picked up two bonus seconds and thus extended his overall lead over his Omega Pharma Quick Step team-mate Michal Kwiatowski, with Niki Terpstra, Tony Martin and Zdenek Stybar a further second back in third, fourth and fifth. The longest stage of the race at 232 kilometres, stage two of Tirreno-Adriatico ran from Indicatore to Narni Scalo and was predicted to end in a bunch gallop. After approximately thirty kilometres of racing, Vini Fantini’s Kevin Hulsmans clipped away and then received the reinforcements of Cesare Benedetti (NetApp-Endura) and Garikoitz Bravo (Euskaltel). They steadily built time and had an advantage of eight and a half minutes with 100 kilometres remaining, thirty seconds last than the maximum. Before then, Bravo beat Benedetti and Hulsmans to take the mountains points at the first climb, Massa Marittima (km 44.6), while 41 kilometres later Benedetti led Bravo and Hulsmans over the top of the Cantoniera Montebello ascent. The peloton accelerated and brought the gap down under four minutes with seventy kilometres to go. This prompted Hulsman and Benedetti to accelerate, trying to eke out their advantage once again. They were stronger than a tiring Bravo, who was dropped and slipped steadily backwards. Despite their effort, the gap continued to fall and reduced to under three minutes with 50 kilometres remaining. The break raced on to the first passage of the finish line then after a lap, Hulsman took the TV sprint prime ahead of Benedetti. 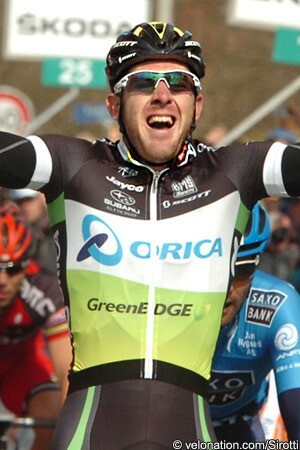 Behind, under two minutes later, Cavendish nabbed third for the bonus. The leaders continued to battle onwards but were eventually swallowed up thirty kilometres from the end. Rain was falling very heavily and this dissuaded others from having a go for some time, but didn’t stop Cannondale’s Macej Bodnar, Cavendish and the latter’s Omega Pharma Quick Step team-mate Michal Kwiatkowski from taking places first through third in the next intermediate gallop. Sep Vanmarke (Blanco) was feeling good and surged clear 21 kilometres from the line, taking his chance as the rain became even heavier. He got a slight gap but was reeled in several kilometres later. The bunch crossed the finish line once again with 12.1 kilometres left and the sprinters’ teams continued the buildup to put their top riders in the best position prior to the gallop. With five kilometres left Peter Sagan’s Cannondale Pro Cycling squad took over, driving things onwards, but other teams were also close by and poised. They gradually moved up alongside and then past the Cannondale riders inside the final two kilometres, although the team remained prominent. Under the kite, the BMC Racing team put a rider on the front and briefly lined out the bunch before he faded. Orica GreenEdge and Lotto Belisol were then the most prominent and opened the sprint, with Peter Sagan kicking but running out of steam. Matt Goss timed things pefectly, though, bursting through, grabbing his first win since last year’s Giro d’Italia, and leaving several more-highly tipped rivals in his wake.